The colorful winter flowering Algerian Iris, Iris unguicularis is a reliable plant in our garden. The name hints a little about the Mediterranean origins of this plant. One of the most useful and easy care winter flowering plants, Iris unguicularis will form a nice clump over time and are useful for planting beneath deciduous trees. We have been growing these for many years in a lightly shaded position beneath a deciduous tree and they seem to love it. A white flowering variety, Iris unguicularis ‘Alba, same flower form but white with yellow’ is also available for sale. ‘Albington Purple’ smaller flowers and recurved petals, a deeper blue than the purple of the species. A clump forming rhizome rather than an actual bulb, Iris unguicularis require very little care and seem to thrive on neglect, although a little seaw eed fertilizer at the begriming of winter seems to give them a boost. 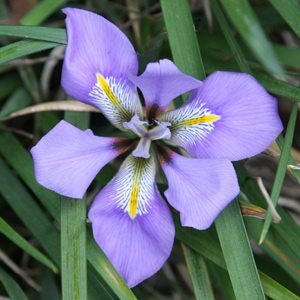 Drought tolerant once established Iris unguicularis can also be grown in sun. Propagation is best by division in early spring, or late summer. Good drainage in summer is important. The idea of pruning back the foliage each autumn to allow the flowers to be more readily seen is one that does not really carry much weight. Although the flowers are held close to the ground, they sit neatly in the foliage and are pretty in winter. Larger clumps will become congested after a number of years and to promote good healthy growth they will need to be divided. limit fertilizer to one watering of liquid seaweed in spring. divide clumps only when you really need to. Iris unguicularis are available for sale from the following nurseries.